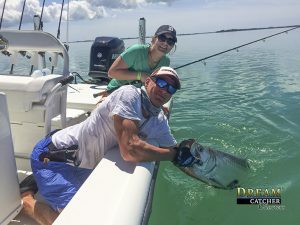 Home » Fishing Reports » Backcountry Fishing » Is It Tarpon Time? – Maybe..
Tarpon fishing in Key West is almost year round with good fishing in February. Don’t get excited I am not getting ready to tell you that if you plan on being here on February the 23rd that you will have loads of shots of tarpon. My crystal ball just does not go out that far and yes, I think that might be a thing…. But.. What I will tell you is that if you get out with me or any of my fishing guides here at Dream Catcher Charters in the next foreseeable week or so, I betcha we will get you some shots at the Silver King. Capt. John posing with his angler a fun tarpon here in Key West. In the last few days since the frigid temps our Key West fishing guides have been jumping 1-5 fish per trip and landing some. For February this is a 10 of 10 for YAY factor because typically we don’t get any numbers of fish till March. Backcountry fishing Key West has been awesome as well with many different species to choose from.. Including permit while flats fishing. I can say from what we did and saw today on the water just off Key West we have some great days coming as long as the weather doesn’t do anything freaky. I will be certain to have my guides push for them first thing in the morning for anglers who would like to roll the dice on catching an early season tarpon to go home with. Book A Tarpon Fishing Charter With Us. Booking For February is looking great. We are staring down the barrel of another crazy season of fishing here at Dream Catcher Charters. CALL US>> we will check the schedule and let you know what we thing on a day to day basis on the bite. There is nothing like cheating the summer for a nice big early season tarpon in the cool air of February.